I was mucking about with washes, and I thought I’d do something a little different with this pale, almost flesh-toned wash I did on one of my last blank handmade postcards from India. The lunar black paint made exquisite textures as it granulated and pooled in the surface of the card, giving the tentacles a half-real feeling. I like this effect with the tentacles spiralling in from all sides, so I’ve optimistically called this #1 in the hopes that I manage a series out of it. 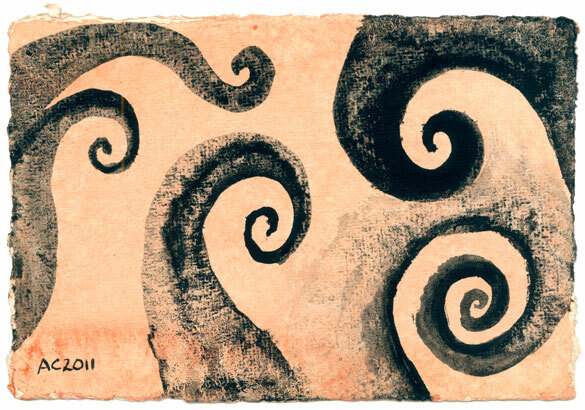 Tentacle Spiral 1, 6″x4″ watercolor on handmade postcard. 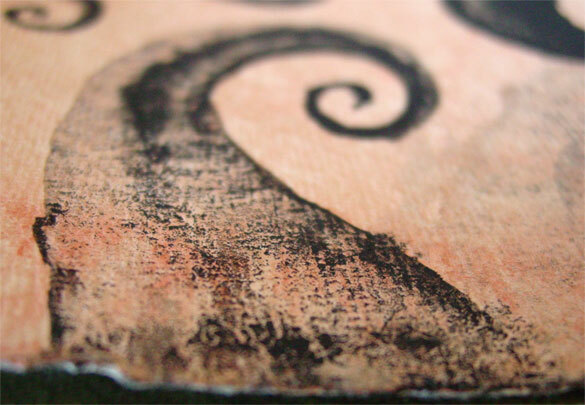 I took a close-up of one of the spirals so you can really see the texture. 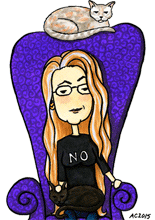 It’s tentacles and spirals, what’s not to love? 😉 Thanks!